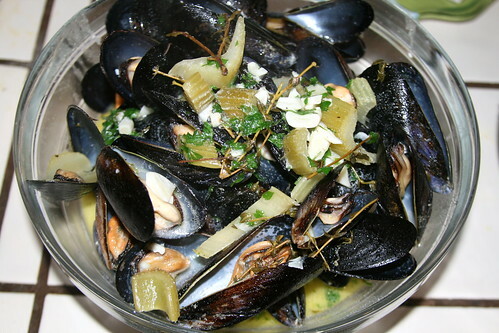 Moules à la Marinière is a classic French meal made with mussels cooked in white wine, butter and cream. You eat it with warm French bread. Yes, it is every bit as glorious as it sounds. Our second course was mussels: Moules à la Marinière.. I adapted a recipe from the Balthazar Cookbook. I love this recipe because it has lots of good healthy saturated fats: a whole stick (8 ounces) of butter, plus 1/2 cup of creme fraiche (cultured cream). The recipe also calls for 5 pounds of mussels (you could probably get away with 4 pounds). It will feed 2 very hungry people or 4 moderately hungry people. If you serve this with fries and crusty bread, and a salad or soup, you could easily feed a family of 4-6. (We didn't have fries or a salad; we just ate mussels and bread). 1. Keep your mussels in the fridge on ice while you so all your chopping/preparing of ingredients. 2. 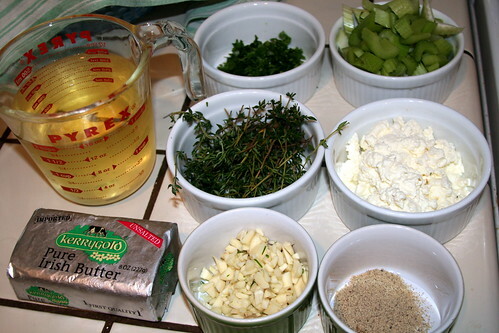 When you have everything ready to go and you're all set to eat, set a large stock pot on low heat and melt the butter. 3. Add the celery (sliced on the bias), garlic, and thyme and sautee for 15 minutes. 5. The vegetables should be soft, but not brown. 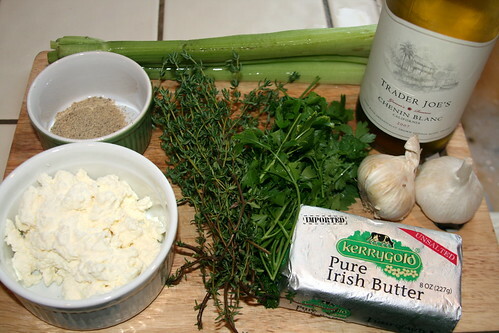 Add the wine, creme fraiche (or yogurt cheese or cream), and turn the stove up to high. It should come to a boil pretty quickly. 6. Stick your bread in the toaster oven or in the broiler. 7. When your broth is boiling, add the mussels and cook for 3 minutes, or until all the mussels open. As they open, remove them one by one with tongs and set them in large serving bowls. Discard any mussels that do not open. 8. Add the chopped parsley to the broth, stir gently, then pour the broth over the mussels. Serve with crusty bread for dipping. Seth said this meal was outstanding. I have to agree. The best mussels I have ever eaten. Ever! If you served this dish at a dinner party with real French fries and Belgian ale or a crisp white wine, people would think they died and went to heaven. I like it when you post your recipe and process like this. It helps me understand how you are making the amazing-looking meals you create. Thanks for the lesson! Thank you, Jessica. I’m going to be doing more of this. I just have to remember to keep my camera in the kitchen! I second that! Keep doing that! It is so easy. I’m so visual. I also need to remember to keep my camera in the kitchen! I hope this isn’t too late to comment. Oysters and mussels haven’t been in my cooking repertoire, but I’m trying to change that! I went to a different farmer’s market this morning and was taken by the great fesh seafood. Well, a whole red snapper tempted me (of course I got home and found it on the AVOID sustainability list the Monterrey Bay Aquarium puts out). And I bought 5 oysters. Five, because that’s all they had, and five because I had no clue what to do with them. Red snapper was a disaster. I grilled it according to a recipe online, but glossed over the instruction to split open and butterfly. So my whole fish was under cooked, despite the extra time I gave it. I did give my son a thrill by trying to eat the eyeball, but it was like a big half cooked piece of rice – no flavor, gummy, and hard in the center. And oh yeah, your Carlsbad Aquafarm oysters are farmed in the next town just north of me and the aquafarm owners are parents of one of my son’s classmates. Nice family. We pass those white bobber things in the lagoon all the time on the coast road going to the beach. Any idea of these oysters are still ok if I get an oyster knife tomorrow? There’s a Sur La Table only 7 minutes away, hallelujah! (in the same shopping center as our locally owned natural foods store, but dangerously two doors away from the Apple store). The same thing happened to me the first time I tried to shuck oysters. Some misinformed person told me I didn’t need an oyster knife and I could use a butter knife. He said I just needed the right flick of the wrist. Uh, yeah, not so much. I ended up getting so frustrated I dumped the lot of them in the trash. I bought my first oyster knife at Sur La Table. You can find a good one there. I’ve since found a cheaper one (and one I actually prefer) at Surfas, our local restaurant supply store. I think the one I bought at SLT was like $15 and I got it for under $10 at Surfas. But if you need one now and you don’t have a supply store, go to SLT. Yes, the oysters will keep. I’ve kept them for 2 or 3 days. Best to eat them right away but they’re fine the next day or the day after. Wrap them in a wet dishcloth or put them in a bowl of ice and put them in the fridge. Thanks a billion! Got the knife at SLT (tried F&S first, but they didn’t carry oyster knives). Worked like a charm, though a few ended up with bits of shell in them. Your shucking description was perfect. My husband isn’t wild about shellfish, but he was a sport and ate two, which left three for me, which was just right as an initiation. Our son couldn’t be persuaded, yet he loves sashimi – go figure! He was itching to scram for a sleepover down the street anyway. He may come around if I serve oysters often enough; it’s happened with lots of other foods. I’ll try your mussels recipe the next time I get back to the Vista farmer’s market with the great seafood vendor. Gotta love anything that uses 8 oz of butter! I found some really yellow artisan Spring Hill jersey butter this afternoon at one of the local farmer’s markets, but I’ll have to hide it or my hisband will eat it all himself. He’s a butter hound (scrapes up big mounds of butter with walnut halves – Jane Brody would scream if she saw it). I realise this is an old post, for future reference, is it okay to comment on old posts? I just had a question regarding farmed shellfish, which I was wondering if you could share your thoughts with me! I live in New Zealand, where shellfish is abundant and plentiful! And CHEAP! 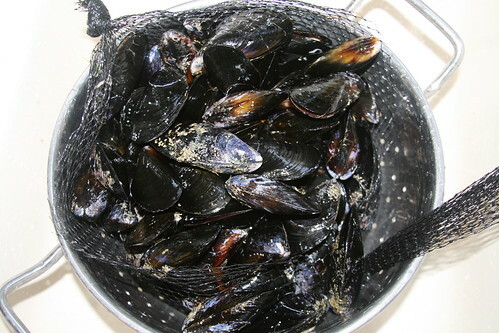 I can buy 1kg (2.2pounds) of live, local mussels from the supermarket for $3.00 The only problem is, they are farmed! I was really surprised at this, why, in a country with so much sea food, do they need to farm it? Any way, after learning this, I stopped buying the mussels. Which I was so saddened about! As for my whole life, I hated sea food, and would never touch the stuff. However after I started eating the Weston Price way, and began adding new foods to my diet such as organ meats and fish roe. I decided it was time I added shellfish. If I can learn to like liver, then I can learn to like mussels, right!? So it was my first time eating mussels (which I loved!) and my last, because of the farming thing! But then I read in your post, that you get your mussels from a farm? So I am wondering, are farmed mussels okay? I can’t get wild ones. And if they are okay, how is it that eating farmed shellfish is okay, but not eating, for instance, farmed salmon? I used to really enjoy that, but now won’t buy it. However they are sustainably farmed. Maybe you could look into your local shellfish providers and find out if they are sustainably farmed. Most likely they are. I think you can back to enjoying your moules frites! Thanks for the prompt reply ! That’s just the info I needed to know. : ) Can’t wait to try your moules recipe tomorrow night. Thanks so much Ann Marie! Are smoked oysters out of the question? Oh, oysters, white wine and mussels, oh dear! This recipe sounds most delicious for us fish, seafood and natural food lovers. I often purchase items at Trader’s. Way to go; I just had some yum oysters last weekend. Just made this recipe tonight. It was AWSOME! Unfortunately I had to throw away 2/3 of the mussels that I had bought at the grocery store on Saturday because they had died or already been dead when I bought them (not sure which). So I pulled out a box of frozen ones that I had, discarded their sauce and used this recipe. Fantastic! Love it! Thanks for the post. So I got the oysters and I’m about to try out cooking them, so excited! I see some lemon wedges in your picture, to squeeze on top I presume? And no cooking right? No added stuff right, just the opened, raw oyster, and that’s it?! Hmmm, ok…and do you eat them with a fork? I need a bit more direction before I can take the plunge!